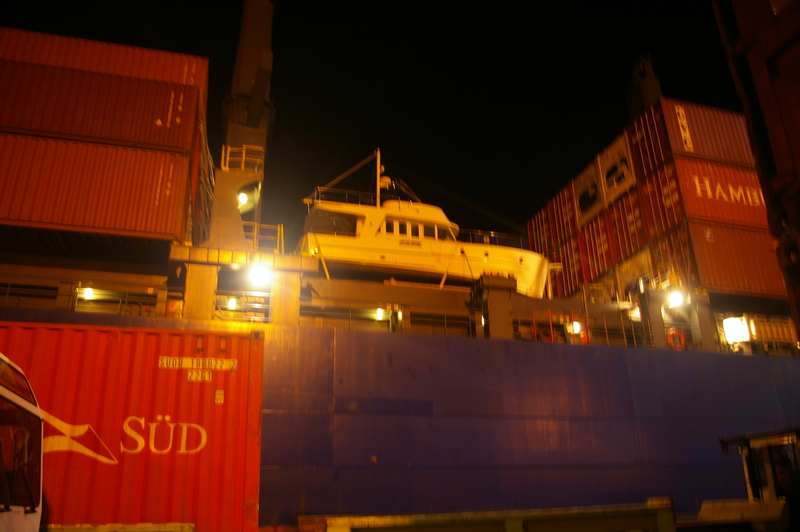 Part one left us at the scheduled haulout to get the Swift Trawler 42 measured for a shipping cradle. Remember, its final destination is South America. 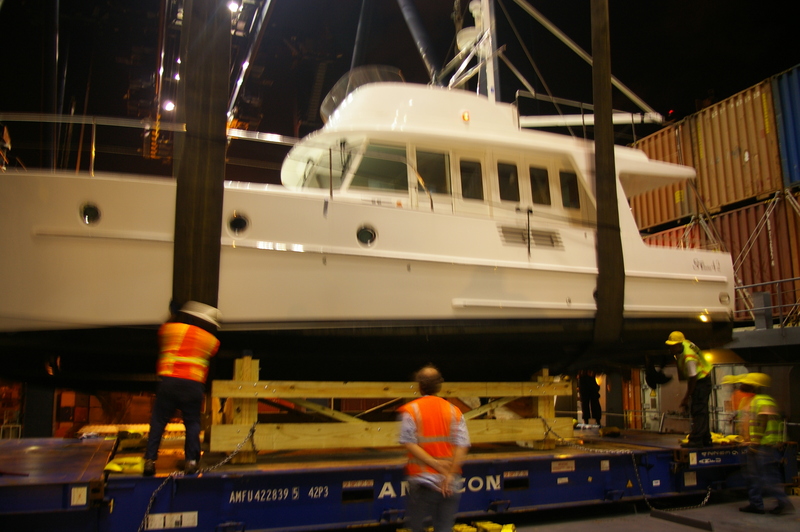 Keep in mind this is a brand new boat headed to southern waters in Chile. 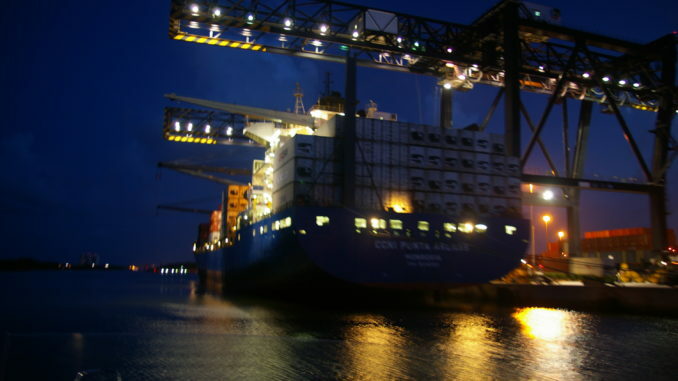 Deck freight aboard a ship is our best option for transport. 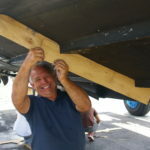 Upon arrival at Lauderdale Marina we schedule a haul out to have the boat measured for a custom shipping cradle. 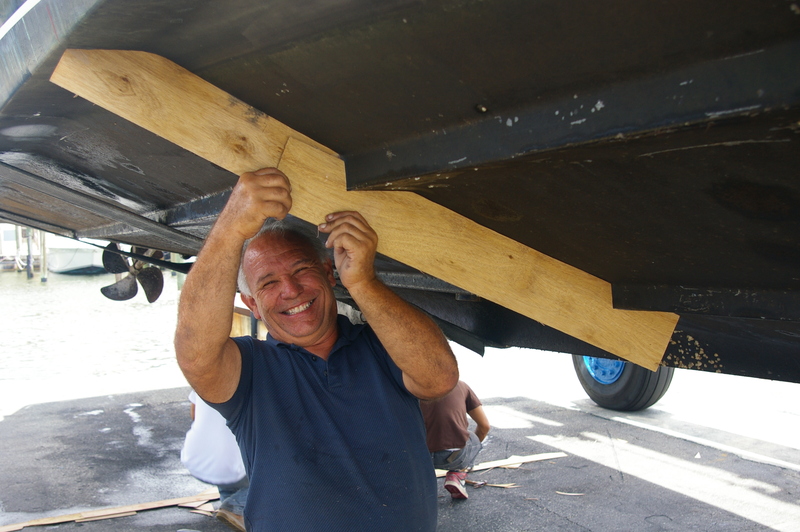 Vincent and his crew drive up from Miami to take the measurements and design a pattern. Our photos below show the craftsmen at work on the couture cradle. 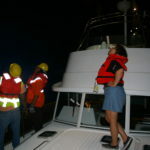 We splash the boat, return to the slip, tie up and run off in the car to get final supplies. Many of the items we purchase may be difficult to locate in Chile so it is wise to get them now. One large purchase is eight 12 gallon rectangular gas tanks. These will be used to extend the boat’s cruising range. 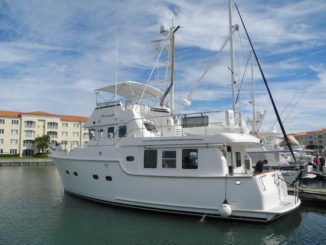 The owner enjoys cruising to the more remote areas of Chile and extra fuel is desirable. Someone suggested we use collapsible fuel bladders but further investigation on our part reveals an air venting issue. The final decision is to use portable gas tanks. These are certified for fuel and fit perfectly on the side decks of the boat without any modification of the vessel structure. When the fuel is pumped into the boat’s main fuel tanks the empty outboard tanks can be stacked out of the way for use on another trip. The owner plans to use a standard portable12 volt DC oil change vane pump to transfer fuel into the main tanks. This way no custom design or installation of equipment is required. After ordering spares of every kind imaginable the new owner drives to the airport for his flight home to Chile. 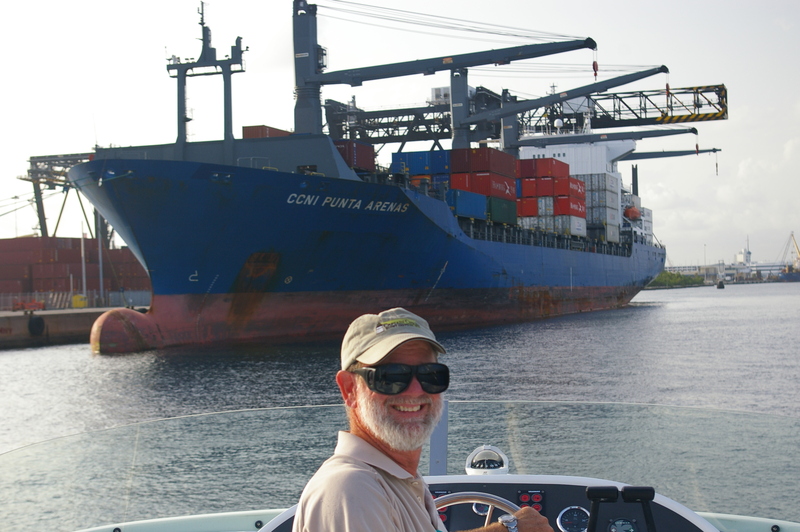 Fast forward to a few weeks later… Alyse and I arrive to make the boat ready for shipping as deck freight. 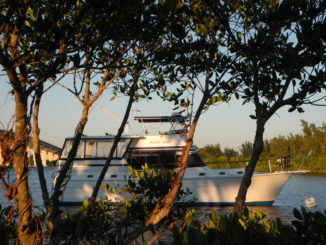 We drive to Fort Lauderdale collecting all the “spares” from boat stores along the way and then the fun begins. We play puzzle-master finding places to neatly stow all the new purchases. 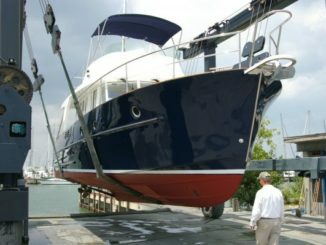 We secure the dinghy boom and mast and remove the Bimini canvas as this Swift Trawler 42 will be on the weather deck as she travels to Chile. 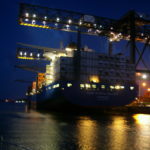 We tape all hatches and doors in anticipation of the heavy seas experienced on a container ship. All is completed so we settle in to wait for “the call”. The sun sinks below the horizon as threatening storm clouds build from the west. We turn on our navigation lights. Darkness has arrived. It is 930pm and the shadows play tricks with depth perception. 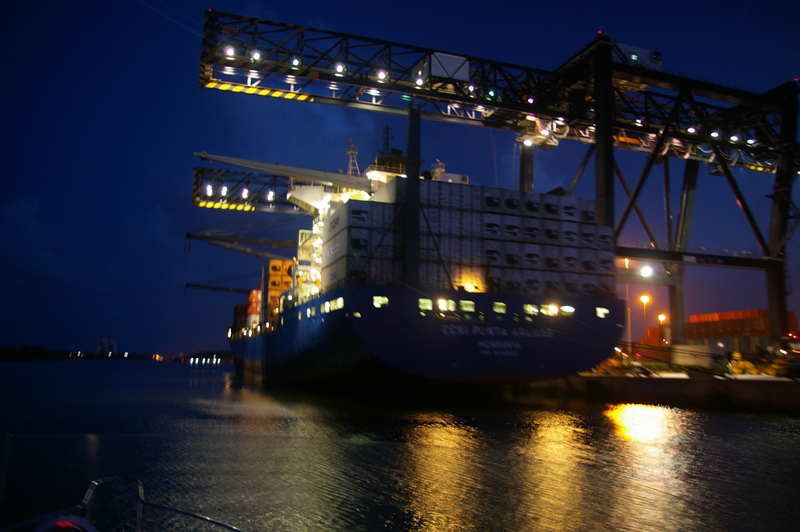 Carefully, we come alongside the commercial pier to take 2 longshoremen aboard. These new additions to our crew will help with the placement of the lifting slings. 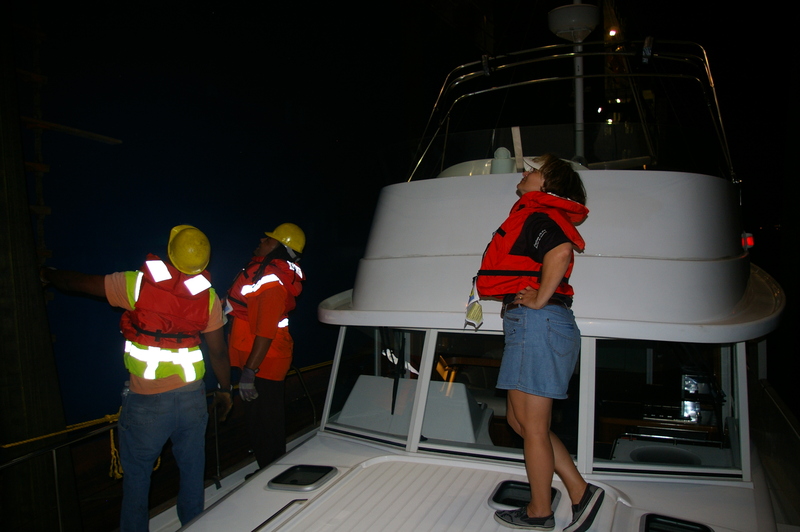 Lifejackets are donned for safety, adding another layer of clothing in this oppressive humidity. But accidents can happen to those who are careless. As we glide into the slings, the ship’s crane operator takes out the slack and moves the boat nearer to the ship’s hull. Nice and easy. 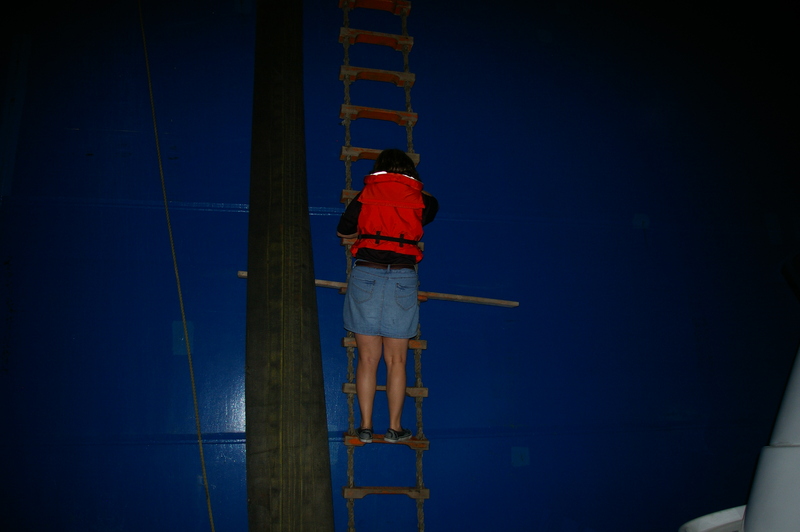 Now for something a bit more adventurous – a Jacobs Ladder is lowered so we can climb aboard the ship. 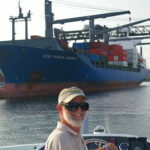 One of the longshoremen hopes that Alyse will chicken out so he can save face too. No chance of that. Up we go STRAIGHT UP the side! As we watch from the ship’s deck the Swift Trawler 42 soars high above the water surface, secure in the slings and is set into the custom cradle. The cradle is secured to the ship with straps and chains. Likewise, the boat is secured to the cradle and ship in the same manner. Many cameras document this arduous process for a photo journal to give to her owner. 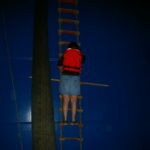 As the workers complete the job, we carry our equipment down then up all the slippery ladders of the ship. Our final exit brings us down a bouncy ramp into a waiting pickup truck then out of the port to our car for the drive home. It’s two a.m. when our heads hit the pillows on our own boat. This was another adventure that goes according to plan, all the players are in place and the pieces of the puzzle come together with no problems. 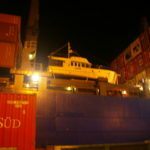 Watch for Part Three when the owner shares his photos after the boat is offloaded from the ship in Chile!